Mooooo! 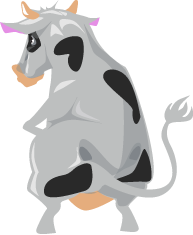 I’m Marymoo the Cow and I run Gadget Island’s first and only advertising agency. #gADget My job is to make sure that the island’s residents keep up-to-date with all new and necessary developments. I’m always here if something happens. I know all the island’s residents, and everyone knows me. As an advertising professional, customer satisfaction is everything to me. When I was young I was a promising heptathalete, but because cows don’t do sports in the Other World, I couldn’t find an elite competition league for me. Like other cows, I was offered a job. As a milking machine operator. The place was some big farm overseas. Because I didn’t have any alternatives, I decided to take the job and I got on a boat. For the whole journey I was bothered by the thought, that maybe I had made the wrong choice. Factory work did not suit my creative nature. When the ferry stopped in the middle of the journey to refuel, I escaped from the ship. #independentcows I didn’t know it then, but I had arrived at Gadget Island. Other animals who had left the Other World lived here, so I decided to settle down too. Soon after arriving I started studying. I did an advertising degree through online study and as soon as I’d graduated I founded the gADget office. In addition to the adverts and exercise, I’m also involved in the activities of Gadget Island’s news agency. #onthepulse #knowledgeispower Life is so amazingly action packed that I manage to exceed my activity wristband target every day. It’s rare that I have time to spend just at home. My favourite way to relax is with a nice walk along the beach with Don Wolf. He’s a real gentleman. If you need to reach me, the best ways to contact me are at the office Muzzlepad and Instamoo @MaryMoo. Cecile the Seal is on the go! Whilst lounging on the beach she found an exciting notice. TAKE PART IN THE COMPETITION! MAKE YOUR OWN TV ADVERT! Design and film an advert! Send it to the following address gADget@gADget.ga. The prize for the best advert is an apPad10! The advert should describe the product or service truthfully. The advert can be a presentation or an acted scene of the product or service being used. The advert should include the product or service’s price. The advert can include music. The advert should be fun. The advert should last a maximum of 30 seconds. Help Cecile to make an advert. The adverts should be made in small groups. The groups select a subject that is important to them, such as a toy or a hobby. They then rehearse the advert and present it to the group. Viewers will vote for which advert should be submitted to Marymoo’s gADget Advertising Agency competition. The adverts can also be filmed. Making a good advert requires skills and effort. The aim is to understand what the purpose of an advert is, and to learn how to assess what makes a good advert. Participants will learn how to present a toy or hobby that is important to them.